In Dallas, Texas, an odd-shaped room under an open staircase was converted into a modern wine cellar, which was designed and installed by Wine Cellar Specialists. 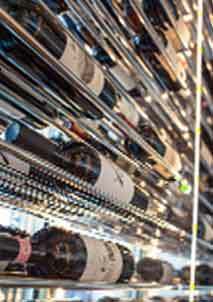 Find out more about the racking system and the wine cooling unit used on this project. When building a wine cellar, the important factors to consider are safety and aesthetic appeal. To create a wine storage space that can protect wine from external factors, the room must be well-insulated. 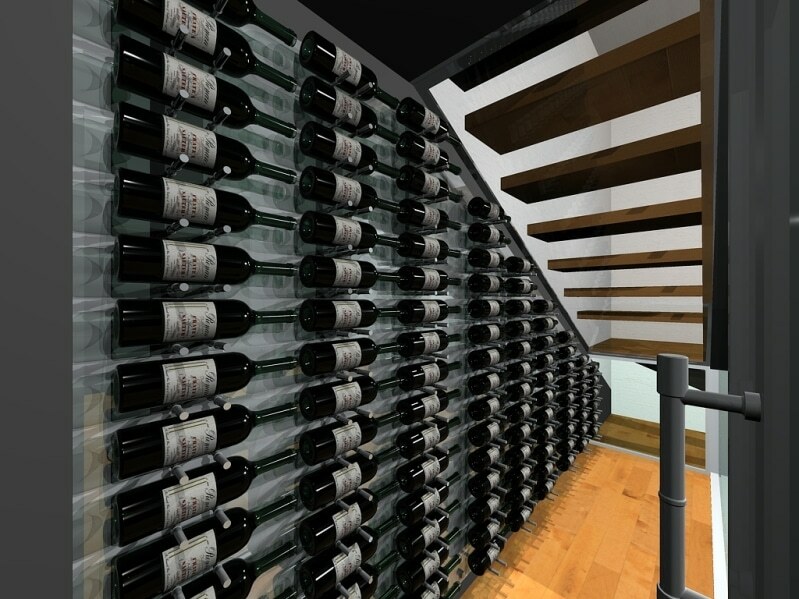 To achieve a visually appealing wine cellar, your chosen builder must design your racking system with creativity and uniqueness. Wine Cellar Specialists, one of our top-notch dealers in wine room construction, always want every client to have the safest area for their wine. They also see to it that every wine cellar design complements the owner’s home and exudes stunning beauty. 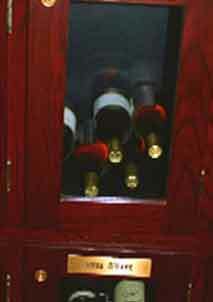 One of their customers in Dallas, who lives in a condo with a modern theme, sought their help for a wine room project. The client wanted to use the space under the staircase to build a functional wine display that would match the contemporary feel of the condo. The stairs, which were open in-between, have steps that were made from bamboo. Under the bamboo landing were steel beams. When you work with Wine Cellar Specialists, they will assess all of your needs and requirements, which enables them to create the stellar wine room design. After a careful assessment, they will provide a free CAD design package, which contains black and white drawings. The images show the different elevations and plan views to provide the owner a better visualization of the completed wine room. On this wine cellar installation project in Dallas, the owners wanted everything in glass, brushed aluminum, and gray color like the steel beams of the staircase. Wine Cellar Specialists created 3-dimensional colored drawings, for a small fee, to provide the client clear choices. There were three options for the wall colors and backer boards. They opted with brushed aluminum pegs, Alumasteel backer boards, and gray walls. 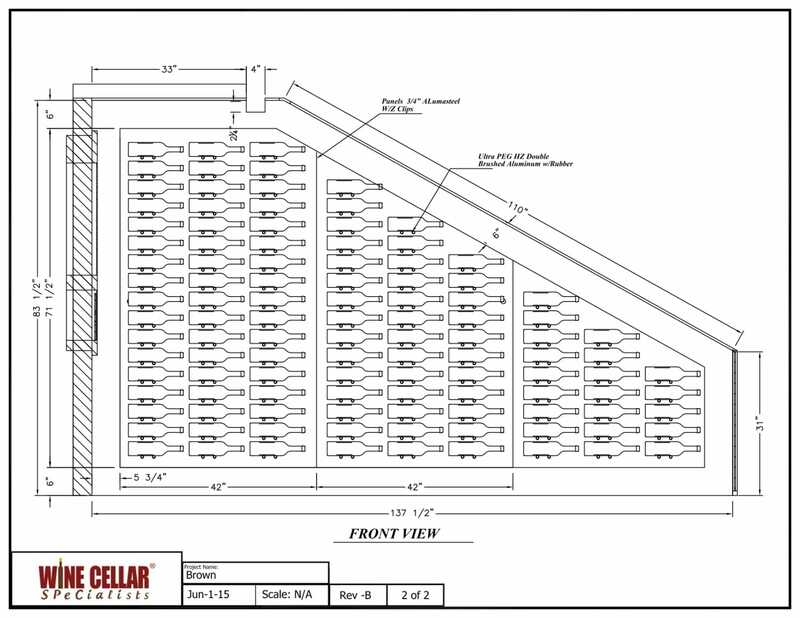 When you look at the drawings below, you can see that the racking is only 1-bottle deep racking. Later on, the customer opted for 2-bottle deep. 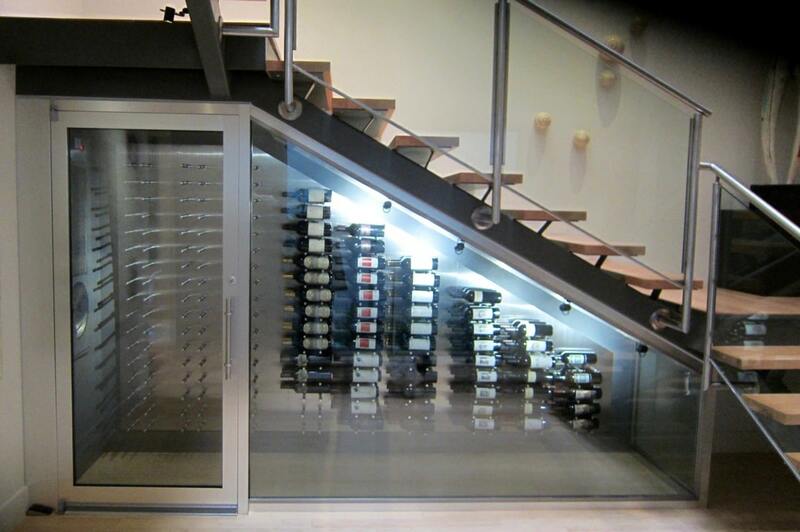 To match the glass below the stair rails, Wine Cellar Specialists used a dual pane glass with a slight tint. The clad framing was made from brushed aluminum. Frosted glass was used for the ceiling to prevent the stairs from showing through. 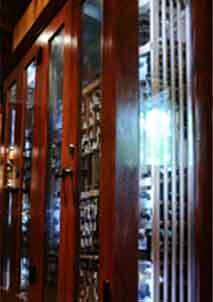 Metal wine racks have been a popular choice for both residential and commercial wine cellars because of their sleekness. Whether you are living in a traditional or contemporary home, these wine racks can easily match any existing décor in your space. If you want to display your collection in a metal racking system, you can go with a wall mounted or stand-alone racking. On this project, Wine Cellar Specialists used the wall mounted Ultra Peg system, a wine storage solution that stores and displays bottles with style. The pegs are made from a durable and lightweight material. They are also highly resistant to corrosion and pressure tested under actual wine cellar conditions. For this home wine cellar in Dallas, double-deep Ultra Peg wine racks were installed to maximize the space under the stairs. This type of racking stores the bottles horizontally with labels facing out so that the owner can find a specific type of wine quickly. The pegs were manufactured from brushed aluminum. There is no need to worry about a bottle slipping out because each peg has rubber O-rings that keep them in place. The Alumasteel panels, which are hung on the back wall, have a color of metal somewhere between aluminum and stainless steel. The backer boards were pre-drilled at the factory before the installation of the Ultra Peg System on site. 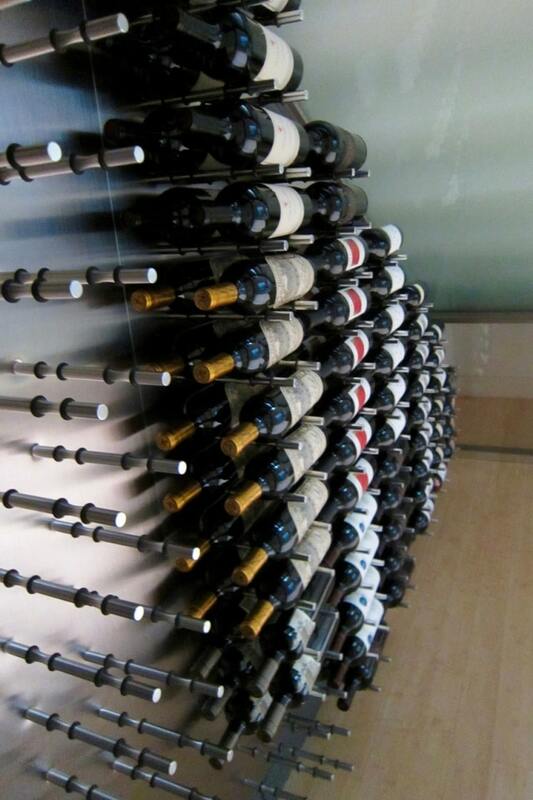 A stable environment in a wine cellar can be achieved if an efficient wine cooling system is installed in it. Your refrigeration unit plays an important role in preventing temperature fluctuations and variable humidity levels. Without it, wine will deteriorate easily, resulting in a waste of investment. 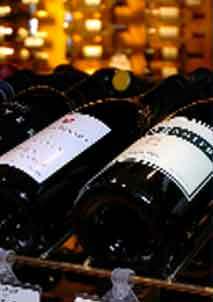 If you are not sure what type, brand, and size of wine cooling system to use, it is best to seek the help of an expert. At Wine Cellar Specialists, they help you choose a refrigeration unit that suits your functional and financial requirements. Wine Cellar Specialists installed a cooling system that fits between the studs on the left wall. They needed to build out the wall a bit for them to add 3”of foam behind the cooling unit. The compressor was placed opposite the wine cellar in the courtyard. They had to run the lines down the inside of the adjoining elevator shaft. They created a soffit on the lower level to run the lines across and out to the courtyard because the client didn’t want their ceiling to be cut or patched up. Another challenge encountered by Wine Cellar Specialists in the installation of the cooling system was the irregular height of the drain line. What they did was to install a condensate pump that was placed within the refrigeration unit. The cooling unit was installed at the end of the left wall. The perfect choice to stabilize the wine cellar environment in this Dallas condo was the WM6600 unit from US Cellar Systems. The largest size single wall mount unit was needed because there was a large amount of glass in the cellar. The unit, which was made of galvanized silver metal, was mounted vertically between the wall studs. 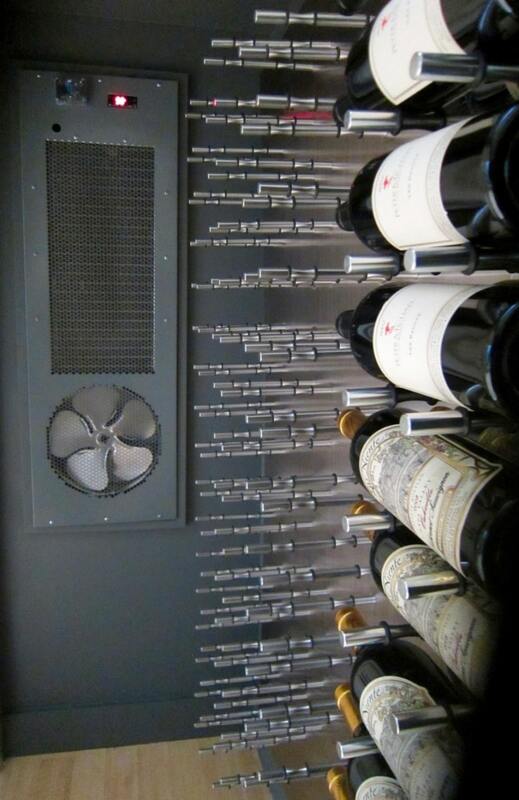 Wall mounted cooling units are ideal for tiny wine rooms and are easy to install. It is equipped with a temperature sensor and digital thermostat. Wine Cellar Specialists coated it in a powder color to complement the wall paint and the steel beams of the staircase. If you are in the Dallas area and are planning to start your wine cellar conversion project, Wine Cellar Specialists can help you. Contact them today at +1 972-454-0480.